A settlement in the mist drawn by Peter Lee. A dock in the Grizzly Hills. The Grizzly Hills, located in southeastern Northrend, is a forested area, surrounded by the Howling Fjord to the south, the Dragonblight to the west and Zul'Drak to the north. It is the homeland of the Grizzlemaw furbolgs. Many furbolgs live in this region, most in the large settlement of Grizzlemaw. Both the dwarven settlement of Thor Modan and the Ice troll fortress of Drak'Tharon Keep, now occupied by the Scourge, can be found in the north. The main faction bases are Amberpine Lodge for the Alliance and Conquest Hold for the Horde. The Venture Co. is also found here, deforesting the land which is a large-scale operation throughout the region. Arugal has also been resurrected and now leads his worgen army in the Grizzly Hills from Bloodmoon Isle. Some furbolgs have also been affected by the corruption of an Old God, being driven to insanity. Magical nuts called amberseeds can be harvested here. For generations, the tribal furbolgs have worshiped a colossal prehistoric bear that roams the surrounding wilderness. 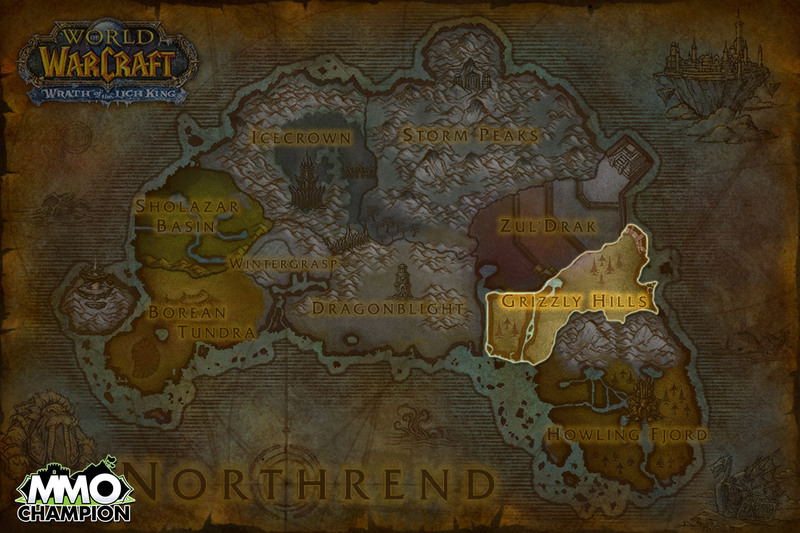 The Grizzly Hills are located in the eastern reaches of Northrend. To the north is the ice troll region of Zul'Drak. South lies the peninsula of Howling Fjord and west is the Dragonblight. Map of the Grizzly Hills. The beautiful scenery of the Grizzly Hills as seen in-game. Grizzly Hills concept art as seen at BlizzCon 2007. Emerald Dreamway, a portal hub within the Emerald Dream. The Grizzly Hills is home to several characters of note. At the Westfall Brigade Encampment, Gryan Stoutmantle leads the Westfall Brigade in the fight against the Horde and surrounding enemies. The Horde is led by Conqueror Krenna at Conquest Hold and Tormak the Scarred, chieftain of the local taunka tribe, at Camp Oneqwah. Other notable characters include the captive ice troll Drakuru, the famous adventurer Harrison Jones, the hunter of worgen Sasha and her mysterious archenemy Shade of Arugal, and the furbolg deity Ursoc, horribly twisted by his tainted rebirth. There are a number of daily quests in the Grizzly Hills that focus on PvP combat and a general conflict between the Alliance and Horde to control Venture Bay, Blackriver Logging Camp, and Blue Sky Logging Grounds. Daily quests include tasks to recover parts and assist NPCs, as well as killing opposition NPCs and players. Players from both factions can speak to NPCs at Blue Sky Logging Grounds to ride a log downstream to the bay where additional quests can be found. Venture Bay can be captured by either faction, which spawns defenders and permits access to the bay's vendors. There are several quest chains in the Grizzly Hills. The Alliance starts out at Amberpine Lodge and are first tasked with taking care of the wildlife and restocking supplies. Players are then ordered to strike up an alliance with the local hunters and trappers based out of Silverbrook, who have a dark secret. Having figured out the situation, players are then sent to figure out what went wrong with Vordrassil, the failed World Tree, and other problems at Westfall Brigade Encampment. Both sides find their way to Granite Springs to deal with the Scourge-infested trolls in the area in quest chains that send players to Drak'Tharon Keep and to the far eastern side of the Grizzly Hills at Drakil'jin Ruins and Squatter's Camp. Grizzly Hills can remind you of other forests during wintertime, except that winter here is year-round. The trees are tall and thick, the pine needles and crisp, clean air produce a pleasant scent, the snow leaves the ground clean and fresh, and the hills themselves are high enough for decent elevation but low enough and gradual enough to be easily climbed. It's one of the nicest regions in Northrend. The dwarves at Thor Modan aren't the only residents. Furbolgs dominate the region, and they make fine neighbors when they're not attacking. The Scourge has a presence here as well, but not strong enough to do much more than block the northwest corner. Wild animals roam the hills, providing plenty of meat and fur and entertainment. It's not an easy land by any stretch, but it's handsome and fierce and full of life. As the human town of Valgarde grew in Howling Fjord to the south, its residents forced the Drakkari and the furbolgs back into the Grizzly Hills and beyond, making the region safe enough for farmers to till the land. Art from Lands of Mystery. The furbolgs claim they were the first people in these hills. So do the Drakkari, though they're concentrated to the north in Zul'Drak. But actually they're both wrong. Dwarves were here first. At least that's what Hardigan Ironjaw, of the Thor Modan expedition, tells. He says the Titans placed dwarves here, after they'd created them. It was an experiment to see if they could survive on their own. They not only survived but flourished, spreading southward and into what would later become Kalimdor and the other continents. Hardigan thinks he can find evidence of their ancestors here in the hills, and uncover truths about their race's early culture. The Explorers' Guild thought it likely enough to send him here, at any rate. Brann Bronzebeard believes dwarves did start in the north, since the Titans were there, but he's not sure they ever settled up there. Regardless, all this was well before any surviving history. Furbolgs don't keep careful records beyond births, deaths, marriages, blood feuds and hunting tallies. The Drakkari wouldn't have cared about dwarves even if they'd seen them, unless it was how they tasted on a spit. So no one really knows what went on here back then. Other stories say that the Drakkari built Drak'Tharon Keep before the furbolgs built Grizzlemaw. Supposedly, the Frost Paws gathered the tribes together in part to fend off the new Drakkari threat. Both races were here and hated each other — the furbolgs had the numbers but with their new keep, the Drakkari were more organized, and the trolls were always more unified than the furbolgs. The existence of Grizzlemaw affected the balance, and the furbolgs' victory over the Drakkari in a series of skirmishes may have led to the keep's eventual loss of Drak'Tharon to the Scourge. You definitely want to stay alert in the Grizzly Hills. Furbolgs don't attack unless you trespass on their lands, or threaten their kin, or steal their prey, or look like you could pose a threat later. Drakkari attack on sight, and so do Scourge forces. The dwarves just want to know what you've seen. This region is the furbolg homeland, and they outnumber every other race here combined. If you've never seen these massive bear-men, that's exactly what they are: enormous creatures with a bear's build and fur and basic features, but a man's hands and, to a limited extent, mind. That's a dangerous combination, and they're powerful in a fight. Fortunately they're not aggressive beyond their own territory. The dwarves at Thor Modan have run-ins with furbolgs on a regular basis, since furbolgs feel dwarf kinsmen are trespassers and grave-robbers. Furbolgs are surprisingly friendly to travelers, though, and can greet your warmly once you assure them you lay no claim to anything in the hills. Although rumors say they're less approving of large groups, and particularly wary of strange races, but no one can't blame them for their caution. The furbolgs have a city here, Grizzlemaw, but it holds less than half their number. The rest are gathered in clans and scattered throughout the region. Each clan has its own totem, and when you see one you know you've entered Snowspring territory or Winterpaw land or Snow Flurry hunting grounds or any of the others. It's best to declare yourself openly once you see the totem, since a furbolg may be watching and won't appreciate your trying to sneak past. The dwarves in Thor Modan were thrilled to see Brann Bronzebeard, and were eager for news of their home. It seems they don't get that many travelers up there, particularly other dwarves. They're not there for socializing, though, and remain focused on their excavations. They have not yet discovered anything of note, but they're still hopeful. The Scourge forces at Drak'Tharon Keep are typical: nasty, violent and focused. They hold the passes between Zul'Drak, the Dragonblight, and the rest of the Grizzly Hills, so that more Scourge forces can reach the east or return to Icecrown Glacier. Map of Grizzly Hills in Lands of Mystery. The Grizzly Hills are as hilly as the name suggests. Along the northern edges the land gains height and depth, approaching the level of small mountain ranges, while it flattens out a little in the south. Thick forest covers the land from end to end, broken only by small clearings or the space alongside one of the many streams and small rivers. Snow is everywhere but the region has little ice — the wind whistles overhead but the trees block it from entering down below, and the hills seem almost warm after the Dragonblight and the Borean Tundra. It's still dangerous, with treacherous slopes and hidden caves and partially frozen rivers, but better than most of the other regions. All manner of wild animals live here because the hills are full of life. Wolves, bears, foxes, rabbits and some small deer are the most common, though there are others as well. Mice and other rodents hide from the snowy owls and other raptors in the trees, but mercifully snakes and spiders aren't present here, as they wouldn't be happy with the temperature. Wendigo and sasquatch prowl the hills, so it's best not to go out alone. The Drakkari live just north in Zul'Drak and sometimes their hunters drift down to the hills as well, in search of prey. The Grizzly Hills have three major settlements, each controlled by a different race. It's strange that all three can coexist here, and even stranger that they're all along the north edge. The southern hills have other furbolg tribes and the random trapper or traveler, but nothing larger than a small village. The Grizzly Hills surround Zul'Drak on both sides and reach all the way up to Crystalsong Forest and the Storm Peaks, making it possible to travel between the northern and southern regions of Northrend without crossing the dangerous Drakkari territory. The humans living and working at Silverbrook and Hollowstone Mine have Russian-sounding names, indicating a unique culture. As such, the humans of the Grizzly Hills are presumably from the same group of humans that lived in Northrend prior to the arrival of the Lich King. Amberpine Lodge has been maintained by the Alliance "for a while", implying it was already held by the Alliance before the war against the Lich King. The initial design layout of the zone in WoW, first presented at BlizzCon 2007. The river west of Amberpine Lodge. A log ride is available for players of both factions at the Blue Sky Logging Grounds. Works in the same manner as a flight point. Patch 7.3.5 (2018-01-16): Level scaling implemented, previous zone level: 73 - 75.